Specially commissioned by SALT for the exhibition Century of Centuries, Trailer is a series of lecture performances conceived and performed by dance artists Erinç Aslanboğa, Natalie Heller and Bahar Temiz that look into notions of personal and collective memory by gathering elements from the past and reorganizing them in a performative frame. The lectures investigate the possibility of creating a space where one can navigate between past, present and future, fiction and reality, and by extension experience their simultaneous occurrence. How do we knit the stories we tell? What elements from the past trail into the present? How do we take hold of a memory? The creative impulse of this work arises from my work with Rosemary Butcher combined with my first impressions of living in the city of Istanbul. I’ve been touched by the sensorial richness of the city, the images and sounds, the architecture old and new, the poverty and wealth… the gentrification… the instability…the beauty… the duality…. the stillness. This piece explores the magic and poetry of a city suspended somewhere in the in between. 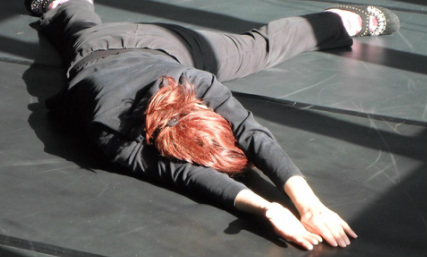 From October 2013- February 2014 I facilitated a group of professional performers to explore body awareness and internal listening through somatic techniques. This live movement installation was an opportunity to share the worlds the groups had been exploring. Movement material and performance: Bella Haeger, Saziye Mese, Kaan Ertem, Ayse Ceren Sari, Gizem Akman and Irem Calikusu. Twelve artists/art historians/art theorists were invited to select an art work from the collection of contemporary art at the National Gallery of Cyprus and to respond creatively to it. The responses were then collected and displayed next to the selected art works at the gallery space Point. Starting point: How does a dance artist respond creatively to a visual artwork? This live performance piece has been created as a response to a painting of a dancer by Andros Kazamias. It is not a response to the physical movement of Kazamia's painted dancer but an interpretation of what I felt to be the artist’s intent. Reflected in the live moving body is a sense of internal conflict and duality. Invitation to spectator: What if a dance work is perceived as a piece of live visual art? Funded by Point with the support of the Ministry of Culture and Education of Cyprus. Performed at point Gallery Space, Nicosia, Cyprus. Using my influential period of study with Rosemary Butcher as a starting point I work with my first impressions of Istanbul to create a 20 minute participatory performance work. Premiered at University of Surrey in the conference 'Performance philosophy- staging a new field' and performed in Görün festival, Çatı, Istanbul. A participatory live movement installation experimenting in the live on the relationship between self and other. How do we negotiate our relationships to other people? What modes of presence makes the other accessible? How do we navigate through aspects of our self before relating to another? This is an ongoing research project supported by Spiral and Horizontal Connections (a platform for the collaboration between dance and academia to meet). Part of a Collection curated by Rosemary Butcher on the theme of memory and the female. Siobhan Davies Studios, London, U.K.
A lecture demonstration using film, movement and the spoken word to explore how we read meaning into what we see. The 20 minute performance was followed by an answer/question session. Siobhan Davies Studios- London, U.K. In this piece I explore the body as object. I'm interested in understanding the physical aspect of the body and how 'it is not that different to the things around us'. I am researching the relationship between Self and world. How do we experience and interact with physical entities? Is my body not simply a physical entity, like the 'things' I see and feel around me? I am hoping to embark on an exploration of the ontological place an individual holds within an environment made of inert 'things'. How do we integrate in and belong to the environment in which we live when we experience ourselves as primarily physical entities? What happens to our sense of self? Studio based research led to a 15 minute performance work presented at Laban 22nd November 2012. How do we read meaning into what we perceive? Merely by perceiving we are already creating meaning. We need to understand the world around us to be able to interact with it. We are constantly trying to understand what we perceive. In this project I explore how mirror neurons transfer sensation from performer to audience member, how abstract images leave space for the audience to participate in the creation of meaning, how our expectations and memories form the way we perceive. In an investigation guided by Rosemary Butcher I explore the self through time: memories, traces of others, aspects of self, the present and the past folding into each other. A participatory live movement installation experimenting with how we negotiate our relationship to others. I explore different methodologies for engaging an audience, as the work is created through their presence and actions. This is a 20 minute complete work and is available for touring. An interdisciplinary performance exploring the absence of female presence in male dominated public spaces. It was first performed in a traditional male dominated coffee shop in Cyprus. The project was a result of a one month collaboration between an actress, a dancer, a visual artist and a sound installation artist. The sense of the female presence existing despite its physical absence is juxtaposed with the ridicule of its actual absence. Performed in the traditional coffee shop 'Drosia' in Nicosia, Cyprus. A solo piece delving deep into the dual effects of conceptual and emotional heritage. It is on the one hand the thread that holds together our identity; gently rocking us through life, keeping us safe and protected; holding us in a warm embrace; unifying the disconnected phenomena; providing a lens through which things make sense. On the other hand our heritage is a heavy condemnation forcing upon us an identity which doesn’t belong to us. Heavy and foreboding, it creates our destiny. We are puppets in its hands, our likes and dislikes engraved into us, our concepts and ideas fixated upon us by this external force, from which we cannot be free. Funded by the International Theatre Institute Cyprus. This is the second part of the work in progress Ophelia Rewinds which began in January 2011. The work in progress is based on Shakespeare's tragic heroine Ophelia from his play Hamlet. Her story is told in reverse and intermingled with elements from the lifestyle of a modern day woman. As this work develops, exploring the universality of the female condition has become central to the creation process. Poetry from around the world is performed through an interdisciplinary collaboration of dance, theatre and live music. We explore the themes: path, identity and love within poetry from France, Belgium, Egypt, Lebanon, Cyprus, Greece, Turkey, Tunisia, Romania, Hungary, Switzerland and Canada all of which are read in French. The first showing of a work in progress based on Shakespeare's tragic heroine Ophelia from his play Hamlet. Her story is told in reverse and intermingled with elements from the lifestyle of a modern day woman. A site-specific performance drawing inspiration from the lives of two young artists who live in Nicosia, the divided capital of Cyprus. Delving into politically and emotionally charged themes, such as the sharing of living space, the acquisition of territory, the establishment and dissolving of identity, the performers take the spectators on a journey as they weave their way through the old market place. The poetry of French poet Arthur Rimbaud is performed through the live arts of music, live poetry reading and movement. A collaboration between four artists on the themes of love and travel. A deeply human piece, about femininity, love, life and loss. Working through what three female performers take to be sacred this dance theatre piece is filled with tenderness, pain and light. An ode to the celebration of the 50 years Independence of the Rebublic of Cyprus. With 4 performers and an original music score, we get a taste of the irony behind the term 'Independence' as, through movement, we wittness the emotional experience of 2 Cypriot women living in a divided country surrounded by foreign military bases. This piece speaks about the dual nature of the Self. The Self is split between the Confident, Yes-sayer and the Trapped, Unsatisfied Negator. The battle is set to determine who will prevail in interactions with the Other. Questions are asked, relationships are formed -between Self and Other aswell as between the two parts of the Self- intimacy and conflict persist....the conculsion is ongoing. A collaboration and research project between 9 performers and 1 musicians, under the direction of Karl Frost. The performers lived together in extreme conditions, by a river, 13 kilometer trek from civilization for one month, training in exercises of physical and emotional closeness. The result was a partially improvised participatory performance which went on tour around San francisco in the summer of 2007. Proximity is a very direct investigation of personal relationship, closeness, isolation, privacy, exposure, and the emotional sub-voices that speak inside of us when we are in relationship to the other. A solo work created for and presented at the first Dancin' Oxford festival. Supported by Oxford City Council.